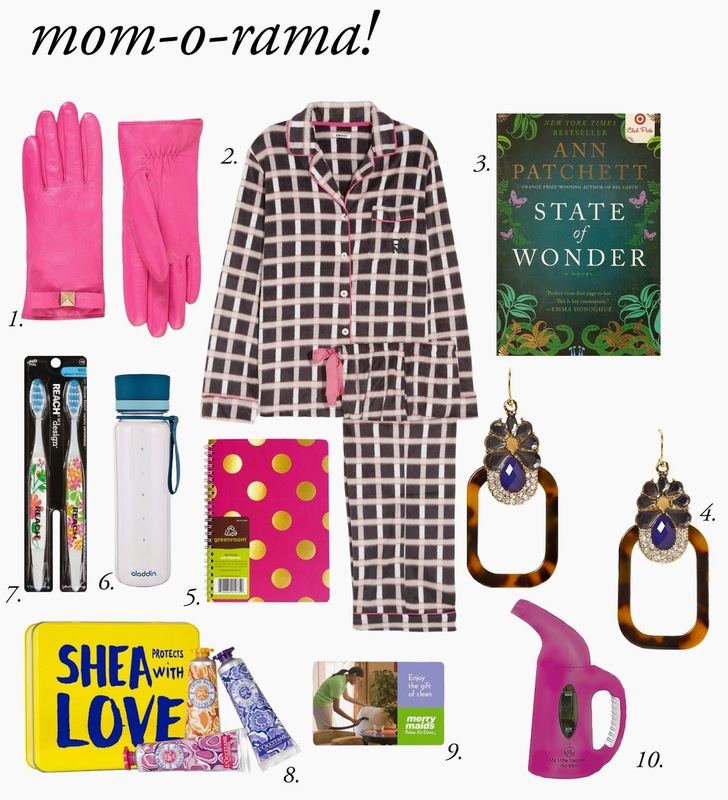 The Spinsterhood Diaries: Gift Guide: Mom-o-rama! Sometimes moms can be the hardest people to shop for. They don't really need anything, but that doesn't mean you shouldn't give her a gift! So, I think the best way to go about gifting for moms is to buy her things you know she wouldn't buy herself. Whenever possible, though, personalization is great. 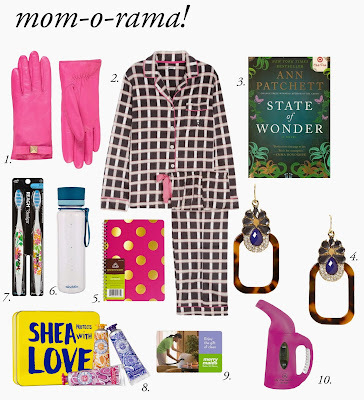 However, since I don't personally know your mom (or maybe I do...), I put together a little gift guide of things I think most moms could use or would enjoy. Notes and explanations will be included. So, at $128, these pink leather gloves definitely qualify as a luxury item, but my mom loves pink, and I think they're really cute. When you aren't a spinster, there's always someone seeing you in your pajamas. So, why not have some cute ones? Other cute options might include these from Gilligan and O'malley or maybe these from Ralph Lauren. When my mom saw I was reading this book over the summer, she almost took it from my apartment even though I wasn't finished. So, I gave it to her for her birthday, and she said she really liked it. So, you've got my own mother's recommendation on this one. These are great neutral earrings, giving your mom the ability to wear them with all sorts of outfits. Everyone likes a new pair of earrings, especially ones she won't have to feel bad about when she doesn't want to wear them anymore. 5. Gold Polkadot Notebook: Target, $3.99. Cute and cheap as chips! This notebook is one of those small ones that's great to keep in your purse or in that drawer by the telephone for little notes. Or, if your mom's a journaler, she could even use it for that. I just think it's cute, and it'd be a great little stocking stuffer...if your stockings are that big. My sister gave me one of these water bottles for my birthday, and it is so excellent. The construction of the bottle makes it such that you can fill it, close the lid, and throw it in your purse, and it doesn't leak. You can screw off the drinking part and fit full-sized ice cubes in there, too. I like to make myself a little iced chai latte in the morning, and throw it in my purse. When I get to work, it's all ready and mixed up. Excellend. A few years ago, these were really easy to find. For some reason, though, I've been having a little bit of trouble finding them lately. I love these toothbrushes, though. They're simple, but they're cute, and they come in a two pack. That way, she always has an extra, and she always knows which toothbrush is hers, because its' printed. I love L'Occitane hand cream, but even more, I love the prints on these little bottles. The size is also great for keeping in your car or in your purse or wherever else you are when you realize your hands are unacceptably dry. I'm not going to lie. I want this one for my christmas present. However, your mom might especially appreciate this gift after the holidays. The Merry Maids can come in and clean up the place after all the gifts have been unwrapped and all the meals have been eaten. Magnificent. I own a white one of these, and I gave my mom the pink one. A steamer is so much more useful than you realize before you own one. There are certain garments that just cannot or should not be ironed. For those items, this steamer's the solution. It's great on dresses and dressy tops, especially.